Mavericks everywhere: Spring enrollment increased by 6.5 percent from spring 2014 at UT Arlington. The University has more than 36,000 students residing in Texas and a total of nearly 48,000 worldwide. Spring enrollment at UT Arlington has surpassed 36,000 students residing in Texas for the first time as the institution’s global number of students in campus-based and online degree programs reached 47,977, preliminary census reports show. The spring headcount represents a 4.5 percent increase over fall 2014 enrollment and a 6.5 percent increase over the same period last year, with undergraduate and graduate enrollment both up over the previous year. 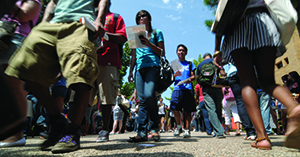 Overall, spring enrollment has increased 43 percent over the past five years, driven by gains in academic reputation and by innovative strategies implemented to meet the needs of working students, including flexibility of offerings, streamlined admissions processes, and staggered start dates for specific high-demand online degree programs. Read more about UTA's spring enrollment. Singer and songwriter Jessie J has canceled her performance scheduled for today, Tuesday, Feb. 10, at Texas Hall, citing exhaustion. The Office of Student Affairs is in communication with the artist's agent to identify a potential reschedule date. Patrons who paid with a credit card will receive a full, automated refund. Those who paid in cash must bring their tickets to the College Park Center box office to receive a refund. For questions, please contact the box office at either 817-272-9595 or boxoffice@uta.edu. Green approach: The Green at College Park, which functions as an ecological water detention system and large-scale rain garden, is one of numerous sustainability projects at UT Arlington. UT Arlington has strengthened its commitment to creating sustainable urban communities through the new Institute for Sustainability and Global Impact. The program follows a successful period within the Office of Sustainability, which has received national recognition from the Environmental Protection Agency for UT Arlington’s efforts to reduce food waste. The office also implemented a new car-sharing program, began the first Global Reporting Initiative report as a Sustainability Action Plan, and in 2011 helped launch The Green at College Park, the first certified Sustainable Sites Initiative landscape. The move is aligned with the University’s Strategic Plan 2020, which aims to enhance quality of life by developing more sustainable communities that focus on the natural, built, economic, cultural, and social environments. 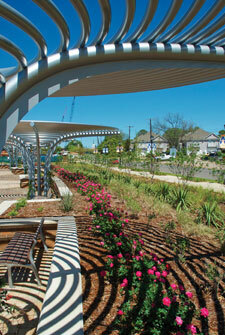 It also unifies and integrates environmental improvement approaches across campus. Meghna Tare will lead the institute as an executive director and will oversee the strategic planning and day-to-day operations. Since 2010, she has served as director of the Office of Sustainability, which will transition into the new institute and eventually move from Preston Hall to a new location on campus. Read more about the Institute for Sustainability and Global Impact. Always verify phone calls about debts, fines, or violations before making payments, the UT Arlington Police Department warns. A new scam using a cloned phone number involves the caller directing the victim to purchase a debit or gift card for money owed or a warrant will be issued for the victim's arrest. The caller says he is with the University, a police department, or government agency. Never make an immediate payment for this type of call. UT Arlington officials will not contact you in this manner or threaten arrest for non-payment of debts. If you receive a call like this, find a published number for the agency mentioned and contact it to determine whether the request for payment is legitimate. Many law enforcement and government agencies do make phone calls or use a collection agency to collect fines. Failure to make payment on a legitimate fine or debt could result in a warrant for your arrest. Call the UT Arlington Police Department at 817-272-3381 if you encounter or have been a victim of this type of scam, if you are unable to verity the legitimacy of such a call, or if you have information about the people committing this scam. Visitors to UT Arlington have more options for paying to park on campus when using a new mobile app, MobileNOW. Daily, weekly, and monthly parking permits can be purchased any time of day. The new app does not replace the UTA parking permit required for students, faculty, and staff. A daily permit is $3 and may be purchased using MobileNOW or in the Parking and Transportation Office in the J.D. Wetsel Service Center, 1225 W. Mitchell St. The daily permit allows the vehicle to park in any student or general permit parking lot until 11:59 p.m. UTA police officers use a handheld, cellular device that checks license plates for the MobileNOW parking permits. The permits are not valid for metered parking. A weekly permit is $8, and a monthly one is $20. MobileNOW charges a $0.30 fee for each transaction. Download the free MobileNOW app. Parking permits are a bargain compared to other options or fines. The annual fee is pro-rated, so spring semester students can purchase a permit for $87.50 this month. See the complete prorated schedule. The privately operated Maverick Parking Garage is another parking option. For more information, visit Parking and Transportation Services or email parking@uta.edu. The deadline for abstract submissions to the Annual Celebration of Excellence by Students (ACES) has been extended until Friday, Feb. 13. ACES is a University-wide symposium highlighting the best in student research and creativity. ACES 2015 is Wednesday, March 25, in the E.H. Hereford University Center. To be featured at ACES, undergraduate and graduate students work with faculty mentors in their disciplines to write and submit abstracts for the competition. UT Arlington is in second place in the competition for the Stanley Security Together for Safer Schools grant. The grand prize is $200,000 in security equipment with a runner-up prize of $75,000. 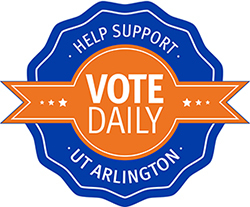 Vote daily through Friday to help UTA claim first place. Vote every day, but only one vote per email address, phone number, or Twitter account. Vote from all your email addresses and cellphone numbers. Ask family, friends, and UTA fans to vote, too. Go online to vote at stanleysaferschools.com, text utaedu to 334455, or tweet using hashtags ‪#‎stanleysecurity and ‪#‎utaedu. Voting ends at midnight Friday, Feb. 13. See official rules at stanleysaferschools.com. David Narrett, professor of history, will discuss the British-Spanish land conflicts that helped shape America at the Focus on Faculty lecture Wednesday, Feb. 11. "Adventurism and Empire: The Struggle for Mastery in the Louisiana-Florida Borderlands, 1762-1803" begins at noon in the sixth floor parlor of the Central Library. 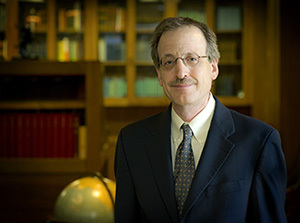 His book of the same name was published by the University of North Carolina Press in December 2014. Dr. Narrett will discuss how British-Spanish warfare in the Mississippi Valley and along the Gulf Coast had a profound impact on the continental balance of power during and after the American Revolutionary War. In this multiethnic conflict, native people such as the Chickasaws, Choctaws, and Creeks were directly involved. Spanish victories over the British shaped the future of U.S.-Spanish rivalry in the region. Learn about the more than 23 million Americans living in long-term recovery from addiction to alcohol and other drugs in the documentary film The Anonymous People. The free showing is at 7 p.m. Thursday, Feb. 12, in the Rosebud Theatre of the E.H. Hereford University Center. The film looks at attitudes, fears, and myths about addiction and the emerging public recovery movement that could transform how alcohol and other drug problems are addressed. RSVP online and to see the trailer. The Center for Students in Recovery sponsors the event. 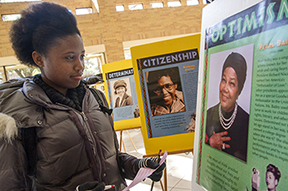 Essence Watkins, psychology freshman, checks out posters of Black History Month's outstanding individuals. See the schedule of events and exhibits. Alternative Breaks trips offer opportunities for students to engage in hands-on, meaningful community service and educational activities. Students can learn the basics of regulations and more at the Institutional Review Board Mini-Conference 9:30 a.m.-3:45 p.m. Friday, Feb. 13, in Room 215 of the Center for Innovation, 202 E. Border St. Sessions include the IRB review process, how to prepare a protocol for submission, a mock IRB board meeting, and a panel discussion. One session can earn you credit for human subject training requirements. See the conference schedule. RSVP to marycolette.lybrand@uta.edu. Regulatory Services and Research Administration sponsor the conference. International students and faculty members can link up with Arlington community members through The Link International Friendship Program, sponsored by the Office of International Education. The Link program fosters an appreciation for how others live and view the world by matching international students and scholars with families and individuals from the Arlington community. Ideally, friendship partners will meet at least once a month for a year. Common activities include conversations over coffee or tea, preparing dishes from each other's cultures, celebrating a birthday or holiday, visiting a local park, or attending a local festival, museum, or film. Apply online to be a community friend or if you are an international faculty member. For questions, contact Josh Garcia at joshg@uta.edu. Progress reports are being posted for freshmen through Sunday, Feb. 22. The faculty deadline is Feb. 20, but instructors can report progress report grades at any time before then, and you can view your progress reports as soon as the grades are entered. See your grades in the MyMav Student Center. See your academic adviser with questions or concerns. A list of advising offices is online. 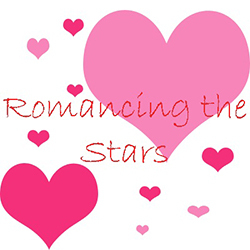 Bring your sweetheart to the Planetarium this Valentine's Day for a special event, Romancing the Stars. The program takes a lighthearted look at the night sky and tells stories of love and devotion that can be found there. Showtimes are 7:30 p.m. Friday, Feb. 13; and 5:30 p.m. and 8:30 p.m. Saturday, Feb. 14. Tickets are $16 per couple. Call 817-272-1183 or email planetarium@uta.edu. Honors Recital Outstanding music students perform. Free. 7:30 p.m., Irons Recital Hall, Fine Arts Building. Music. Softball Maverick Invitational. Tickets $5-7; $3 students. Mavericks vs. Incarnate Word, 7 p.m., Allan Saxe Field. Also, vs. Incarnate Word, 5 p.m., vs. Buffalo, 7 p.m., Friday, Feb. 13; vs. Ohio State. 5 p.m. Saturday, Feb. 14; vs. Sam Houston State, 10 a.m. Sunday, Feb. 15. Athletics. Wheelchair Basketball Tournament Movin’ Mavs vs. Univ. of Alabama, 2 p.m., P.E. Building; Lady Movin’ Mavs vs. Univ. of Alabama, 4 p.m., P.E. Building; Lady Movin’ Mavs vs. Denver, 8 p.m., Maverick Activities Center. Also, Movin’ Mavs vs. San Diego Wolfpack, 4:45 p.m., and vs. Lakeshore Lakers, 8:15 p.m. Saturday, Feb. 14, P.E. Building; Lady Movin’ Mavs vs. Dallas Lady Mavericks, 8 a.m., and vs. Univ. of Arizona, 9:45 a.m. Sunday, Feb. 15, Maverick Activities Center. Movin’ Mavs. Concerts and Recitals Voice Division Recital, noon, Monday, Feb. 16; Clavier Piano Recital, 7:30 p.m. Tuesday, Feb. 17; guest artist Shawn Seguin, 7:30 p.m. Wednesday, Feb. 18. Irons Recital Hall, Fine Arts Building. Music. Women's Basketball Tickets $3 students, $7-$50 others. Mavericks vs. Appalachian State, 5 p.m. Thursday, Feb. 19; vs. Louisiana-Lafayette, 5 p.m. Saturday, Feb. 21; College Park Center. Athletics. Men's Basketball Tickets $3 students, $7-$50 others. Mavericks vs. Appalachian State, 7:15 p.m. Thursday, Feb. 19; vs. Louisiana-Lafayette, 7:15 p.m. Saturday, Feb. 21; College Park Center. Athletics. Softball UT Arlington Invitational. Tickets $3 students, $5-7 others. Mavericks vs. Prairie View A&M, 11:30 a.m. and vs. Texas Tech, 7 p.m. Friday, Feb. 20; vs. Missouri-KC, 10 a.m. and vs. DePaul, 2 p.m. Saturday, Feb. 21; vs. Missouri-KC. 10 a.m. and vs. Prairie View A&M, noon Sunday, Feb. 22; Allan Saxe Field. Athletics. Baseball UTA Hilton Invitational. Tickets $3 students, $5-7 others. Mavericks vs. Southeastern Louisiana, 3 p.m., Friday, Feb. 20; vs. Michigan State, 3 p.m., Saturday, Feb. 21; vs. Houston Baptist, 3 p.m., Sunday, Feb. 22; Clay Gould Ballpark. Athletics. 'Into the Woods' Everyone’s favorite storybook characters are brought together in this award-winning musical where fantasy worlds collide. Tickets $9 students, faculty, staff, seniors; $12 for general public. 8 p.m. Wednesday-Saturday, Feb. 25-28; 2:30 p.m. Sunday, March 1; Mainstage Theatre, Fine Arts Building. Theatre Arts. Dr. Seuss's Birthday Celebration Celebrate the beloved children's author Dr. Seuss on his birthday. Children can read with UTA students and enjoy Dr. Seuss-themed arts and crafts, face painting, puppet shows, and photo opportunities. Free children's books are available while supplies last. Free. 11 a.m.-1 p.m. Saturday, Feb. 28, Palo Duro Lounge, E.H. Hereford University Center. UTA Volunteers, Freshmen Leaders on Campus, Arlington Public Library. Advising: Time Management Discover how to organize and optimize your spring semester and beyond. Free. 11:30 a.m., first floor, Ransom Hall. Also, 1:30 p.m. Thursday, Feb. 12, and 10:15 a.m. Friday, Feb. 13. University Advising Center. QPR (Question Persuade Refer) Learn the warning signs, clues, and communication of people who may be considering suicide and how to intervene with at-risk individuals. Register online. Free. 2-4 p.m., Room 104, Preston Hall. Counseling and Psychological Services. Resume Writing Workshop Need help with your resume before the Job Fair? Get expert advice and tips on how to build a competitive resume that advertises your strengths and skills. Free. 3 p.m., Room 108, University Hall. Career Development Center. Mock Interview Day Sharpen your interview skills with employers (just like a real interview) and receive feedback. Free. 1 p.m., Room 216, Davis Hall. Career Development Center. Mavs Talk: Stress Learn techniques to manage stress. Register online. Free. 3:30-4:30 p.m., Room 104, Preston Hall. Counseling and Psychological Services. Mavs Process Group Experience new ways of relating to others, share personal concerns, and receive support and feedback. Contact Michael Arnold to register. Free. 3-4:30 p.m. Mondays, Room 310, Ransom Hall. Counseling and Psychological Services. Safe Zone Ally Training Learn to create a visible network of support for lesbian, gay, bisexual, transgender, questioning individuals, and their allies. Register online. 1-3 p.m. Wednesday, Feb. 25; 9 a.m.-noon Tuesday, March 31; 1-4 p.m. Thursday, April 16. LGBTQA Program. Hot shots: Sophomore forward Jorge Bilbao, top, scored a career-high 18 points against Louisiana-Lafayette. Freshman Cierra Johnson, bottom, scored 13 points in the women's game at the Cajundome. The men’s basketball team erased an 11-point first-half deficit Saturday to defeat Louisiana-Lafayette 84-69 at the Cajundome. Sophomore forward Jorge Bilbao scored a career-high 18 points, grabbed seven rebounds, and blocked two shots. Junior guard Johnny Hill added 16 points and six assists but will miss the rest of the season with a wrist injury. The game, which was televised on ESPN2, marked the 150th career victory for coach Scott Cross. The Mavericks visit Texas State on Thursday, Feb. 12, and South Alabama on Saturday, Feb. 14. 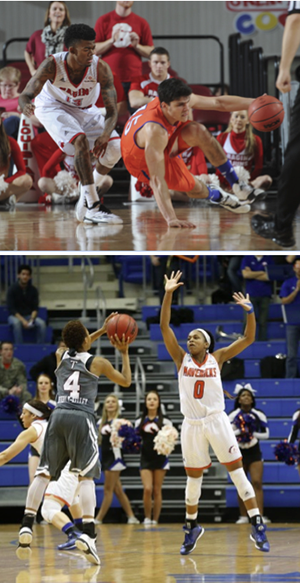 UTA outscored Louisiana-Lafayette by 20 points in the second half Saturday to post a 57-51 victory at the Cajundome. The Mavericks rode hot shooting by freshmen Rebekah Van Dijk and Cierra Johnson and junior Toma Zaleckaite. Van Dijk earned her 11th double-double of the season with 14 points and 15 rebounds, while Johnson and Zaleckaite each scored 13 points. It was the team’s third consecutive win. Next up are road games at Texas State on Thursday, Feb. 12, and South Alabama on Saturday, Feb. 14. The Mavericks won four of five games over the weekend at the season-opening Tangi Tourism Lion Classic in Hammond, La. UTA defeated Alcorn State, Tennessee-Martin, Nebraska-Omaha, and Southeastern Louisiana and lost to Nicholls State in the three-day tournament. The team opens its home season Thursday, Feb. 12, against Incarnate Word in the first game of the Maverick Invitational. The Mavericks also face Buffalo, Ohio State, and Sam Houston State in the four-day event. • The women’s tennis team defeated Dallas Baptist University and Seminole State College on Saturday at the UTA Tennis Center. • After losing to Rice University in Houston on Friday, the men’s tennis team bounced back with a home victory Saturday over Seminole State College. • The golf team opened its spring schedule Monday at the 2015 Barona Collegiate Cup in Lakeside, Calif. The 54-hole tournament wraps up today, Tuesday, Feb. 10. • The baseball team begins its 2015 season this weekend at the Stephen F. Austin Tournament in Nacogdoches. • The men’s and women’s indoor track teams compete Saturday, Feb. 14, at the Varsity Apartments Invitational in Wichita, Kan.
Upcoming entry deadlines for intramural sports include rock climbing, today, Tuesday, Feb. 10; racquetball, Friday, Feb. 13; wheelchair football, Tuesday, Feb. 17; outdoor soccer and foosball, Wednesday, Feb. 18; tennis, Friday, Feb. 20; and 4-on-4 flag football, Wednesday, Feb. 25.